Sometimes certain cutters can be kind of tricky. Especially when you’re working from the side view. 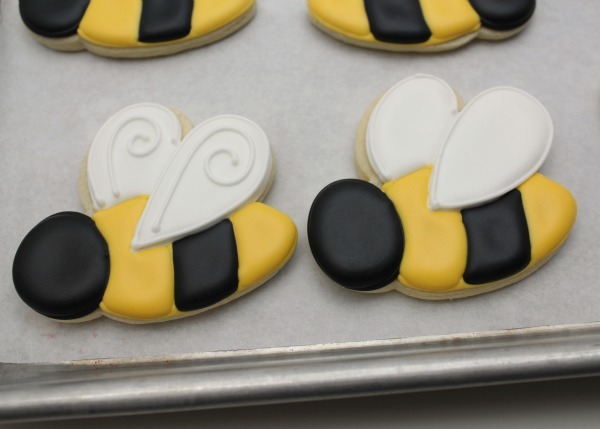 Here’s a few tips on simplifying bumblebee cookies. First of all, I used a side view bumblebee cutter, which you can find HERE. I would definitely recommend picking these up because I use all of them often. First things first, the big secret. This is it. 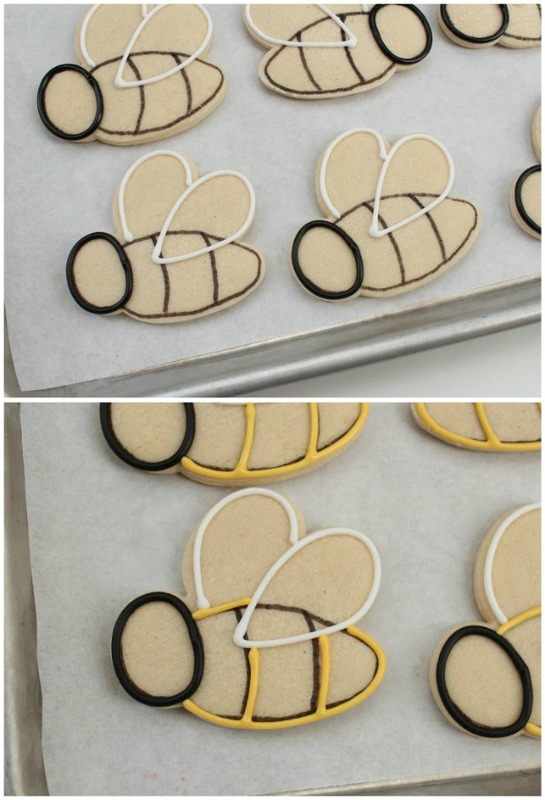 I begin by drawing the bee body onto the cookie. 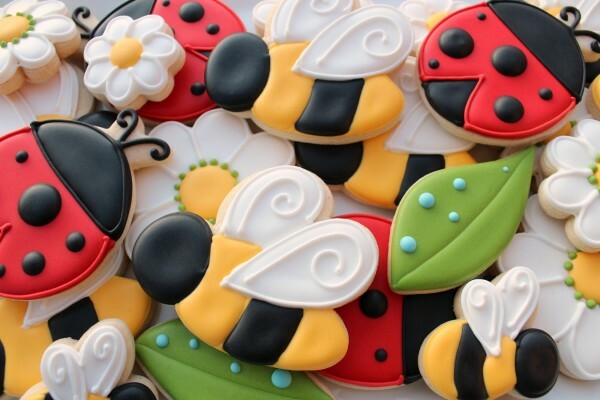 Sometimes I do this to other cookies and after a few I get the hang of it, but I have to do it for every single bee, every single time. It’s the only way for me to get the wings and stripes just right. Once the bodies are outlined, pipe on the front wing with a #3 tip. Next add the second wing. After that, outline the bee’s head, also with a #3 tip. Let that dry for a few minutes then outline the body in yellow with a #2 tip. Next begin filling alternating sections, allowing time to dry in between. I go in this order. Middle, back wing, front and rear stripes, then head and front wing last. I do this to prevent bleeding and also to give the cookie a little dimension. You can stop at this point, however, I always like the whimsy of adding a few extra squiggles and lines with a #1.5 tip. I also like them with more bees! Anyway you cut it, these cookies pass the cute test. 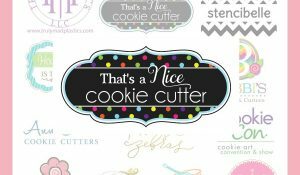 Like I said, you really should purchase THIS CUTTER SET. I use it for several different things, which I will show you soon, and I also ran across THIS IDEA recently and fell in love. 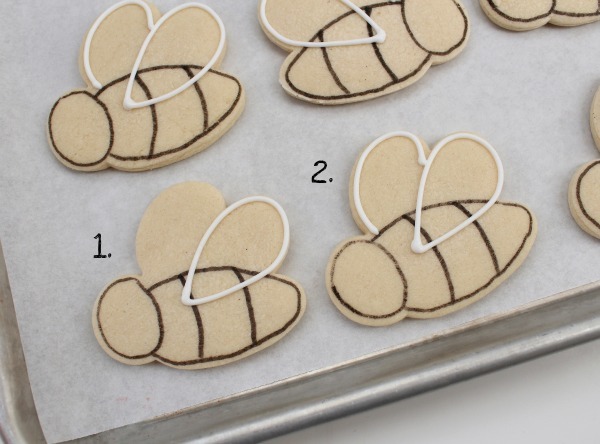 If you like these bees but don’t have the right cutter, check out Lila Loa’s bee cookie tutorial HERE. Or THIS ONE from the Bearfoot Baker. To learn how I made the “A” cookies, click HERE. I am so ready for the weekend. I plan to spend it relaxing with my family. I hope you enjoy yours also! Love your ideas!! You are so inspiring….so happy to see bees:). I started decorating cookies in the fall so each season is so exciting! I’m hooked! Wow! These are so super cute! Great job, and thanks for the tutorial! How cute! As always everything you do! You know, I follow you with passion. You have a big fan in Italy! Thanks for inurcdtoing a little rationality into this debate. Very cute – and perfect for the spring weather we’ve already got! You have addressed my #1 one problem….I never know when doing a more complicated cookie whether or not I should ice the body first (for example) and then pipe the wing OVER the body or do like you did – which looks so much cleaner. I think it requires planning, which I need to do! I always enjoy your posts that show the order in which you decorate the most. It really, really helps see how it should be done. Thank you for taking the time to do these for us….! I am always amazed how how your cookies have so much dimension. One problem I have is when I do one “section” and come back later to do the next, either one section “runs” over a little on the other or it does not meet up exactly and I have to do alot of “toothpicking”….you make it look so easy…is there a trick? oh so cute and your drawing of the lines is great, mine would be all patchy and worse than my piping. There’s those bees!!! 🙂 I LOVE them, of course! The swirls are the perfection addition! Thanks for the great tutorial on one of my favorite cookies. The whole platter is GORGEOUS! Have a wonderful weekend with your family, Callye! Have I told you before that I want to be you?!? So impressive! these are soo beautiful, you are an artist! These bees are so darned cute! What an adorable collection. 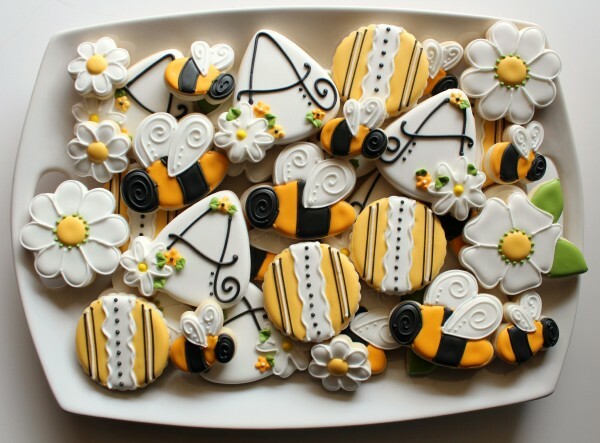 The bumblebee cookie is not my favourite to decorate so I’m really impressed with your cookies and the sweet detail added to the wings. 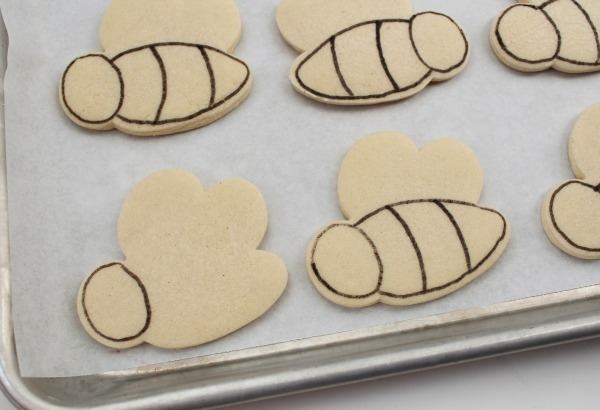 No wonder you use those cutters all the time your cookies are just Bee-u-tiful 😉 You always make the piping look so very simple with your great instructions. Your timing is perfect! I’m planning a Bee Day party for my daughter!! I know my cookies won’t come out nearly as beautiful as yours, but I’m going to give it a go! Wow- thanks for linking to my site. Imagine my suprise when my tiny little blog had a huge surge in visits! And I’m so glad you liked my cookies, I have loved yours for a very long time! Been waiting for this one! 🙂 LOVE the bees! So stinking cute! LOVE these spring cookies! 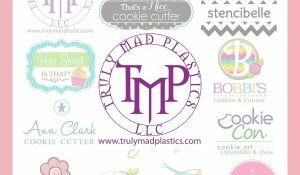 My first try at decorated sugar cookies was using this set of cookie cutters. I should use them again, and see how much I have improved over the last year!! It’s so hard to make things both “simple” and beautiful. You do it so well! So cute, thanks for the tutorial. I always look forward to your posts, I’ve learned so much from you and used so many of your tips andt tricks. I drew my pattern on my cookies for the first time a couple of weeks ago when I was doing a quilted pattern. I used yellow because I was icing them in white but the yellow marker bled into my white icing. Have you ever had that happen? These are so pretty as always. They would be perfect for a bridal shower or afternoon tea party. These cookies are SO PRETTY!! I just love the gorgeous white-on-white details!! And the yellow is SUCH a soft, beautiful shade!!! And the leaf and flower accents are PERFECT. My goodness, I love these cookies! My daughter just gave this cookie cutter set for my birthday. I am now inspired to try them! As usual, cuter than mine! I always forget about those food color markers. I gotta get me one of those. Your talent never fails to astound me. Ever. I adore the colors of these…so bright and Spring-y! Absolutely beautiful cookies, as usual, you are just so talented! 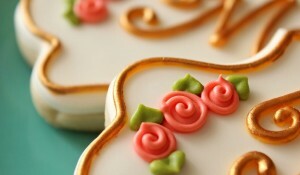 I love the flowers and leaves and I wonder what cookie cutter you used to create these? Did you use 2 and form them together as one? I love your posts so much and have learnt so much from you. Thanks. Thought I would buzz by and say hi! Love these fantastic cookies! I have a doubt. 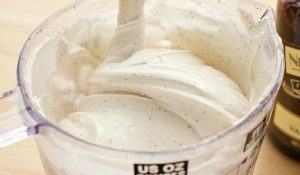 What is the recipe of royal icing that you used at the sweet bumblebee cookies and what is the cookies recipe…because I read some of them in your blog and I want to do the same. OMG – I’m so excited – I actually HAVE a bumblebee cutter! Great tutorial. I know I wouldn’t have thought about the wings until the end & then gotten myself into trouble. THese are totally adorable! So spring like! These are adorable! I can’t thank you enough for taking the time to make step-by-step tutorials. I really need a visual when trying to make cookies like yours (you are my cookie idol, lol). You are awesome!! 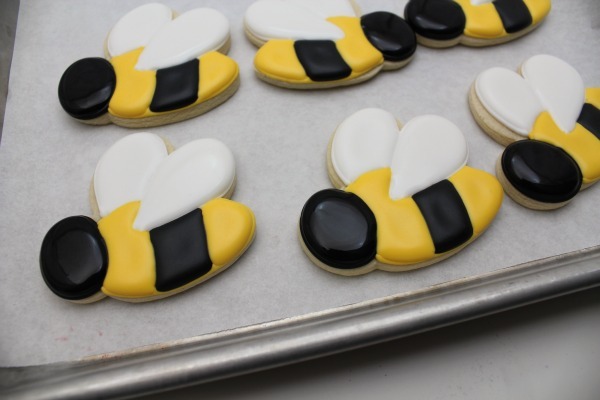 You have reinvented the bee cookie!!!!! What a fabulous tutorial!!!!!! I am simply amazed by your creativity … and steady hand! I never cease to be amazed by your incredible talent! I just wanted to say thank you for all your tutorials! Someone pinned your western cookies and I was looking for inspiration for my son’s rodeo day at preschool. I made a boot, cactus, coyote, cow pattern, chili pepper, and spotted ponies. They were a hit with the parents and the kids. The best part was that the teacher took the remaining cookies to other classes just to brag! 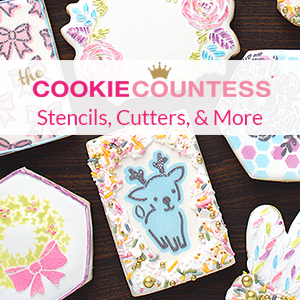 I’ve done a lot of decorating, but I’ve never truly understood cookie decorating fundamentals until your blog. You’re a great teacher! Oh you have such a talent, love these! i think these are just so pretty. would you be willing to share what cutter you used for the white five petal flower with yellow center and green dots around the center and with green leaves attached. . it is on the buble bee platter without the ladybugs. So adorable. The picture at the top is so whimsical I could frame it. Great job! Hi! 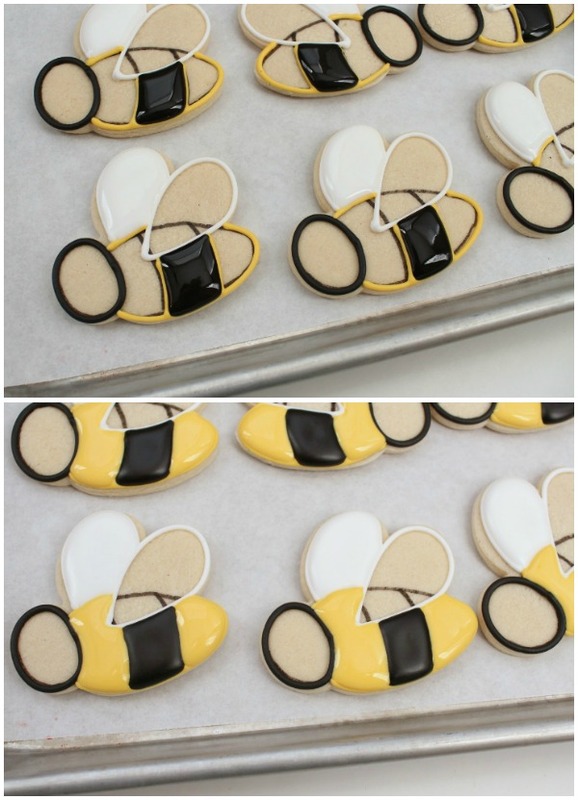 I am an aspiring cookie-ist (I just made that title up) who is planning a bumble bee shower dessert table and I plan to make these cookies. I just received my box from Copper Gifts with my daisy cutters and the WIlton Bug Buddies cutters (bee included). This is a very small bee, and from your beautiful photos (of beautifully crafted and composed platter) above, there appears to be 2 sizes of bee. The bee in the Wilton kit is very small…Do you have 2 bee cutters? If so, where did you get the large one that matches? I was wondering the exact same thing! Ever get an answer? Cookies are too cute for words!